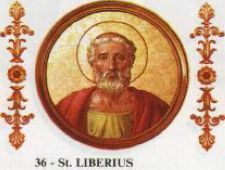 Pope Liberius (352–366), who was not yet "pope" except in the imagination of Roman Catholic historians, became bishop of Rome at a very difficult time. In A.D. 352, the battle between the Arians and the Nicene party was in full swing. Supposedly put to rest at the Council of Nicea (and explained at that link for you), it did not end there at all. It continued to rage until the Council of Constantinople in 381, mostly over the term homoousios. The conflict was made worse by the fact that Constantine's son, Constantius II, who became emperor of the eastern half of the Roman empire in 337, was converted to Arianism by Arius himself. Although orthodoxy had triumphed at Nicea (and orthodoxy it was), in the eastern Roman empire it was often trumped by Constantius' influence. In 353, however, Constantius became sole ruler of the Roman empire, and he and the supporters of Arius were determined to see their influence on behalf of Arian doctrines grow. As Constantius marched triumphantly into Rome in 355, he called for Liberius, the bishop of Rome, hoping to secure his assent to Arian doctrines. He hoped it would lead to a council in Italy, where the Nicene Creed could be overthrown. Pope Liberius would have nothing of it, which enraged Constantius. He threatened to exile him to Thrace (northeastern Greece), and gave him two days to change his mind. Liberius wasn't moved at all. "There is no need of deliberation," Pope Liberius told him. "My conclusion has long been formed and decided. I am ready to go into exile." The Roman Catholic Church refers to Pope Liberius' replacement as the antipope Felix II, but this has not always been so, and he deserves a better reputation. For a long time, Felix was included on lists of popes as Pope Felix II. This happened because he was confused with a Roman martyr by the name of Felix. Now, though, the Roman Catholic Church rejects Felix as an actual pope and lists him as antipope because he was not properly ordained. Antipope Felix II was promoted from the position of deacon. If the structure of the church in Rome had been then as it is now, this would have been an incredible promotion, skipping several major levels. Today, deacon sits below priest, bishop, archbishop, and cardinal, and it would take many years just to climb from deacon to cardinal, much less to achieve the papacy. Things were not then as they are now, however. Felix was making a jump from deacon to bishop without becoming a priest (formerly elder or presbyter), and it was happening because the emperor ordained it. Surprisingly, Sozomen, the 5th century historian, testifies that Felix II was not Arian! Socrates Scholasticus, however, a historian of the same period as Sozomen, says that Felix was embraced Arianism before being ordained (Ecclesiastical History of Socrates Scholasticus II:37). He then hints that this may have been forced upon him. This is a fascinating quote about money, but it is also an interesting statement about the battle between the Nicene party and the Arians. Pope Liberius points out that Christ is "in every way like his Father," but the word he uses is homoios, not homos. These two words are part of the Arian–Nicene difference. Homoousios is what the Arian bishops objected to. Homoiousios would be a compromise, saying that the Son is of similar substance to the Father, rather than being of the same substance. Arian bishops would have rejected both terms, but "similar" in substance still allows the Son to be a creation of the Father. Arians could have lived with that terminology. The Arian controversy can be difficult to understand. I do my best to explain it on the Trinity page, but I need to explain something here. For orthodox believers of that time (and earlier), homoiousios, or similar substance, would not have been good enough. The Son is the Word of God. He came out of the Father, so he has to be the same substance as the Father, not just a similar substance. For earlier believers, homoiousios would have been even more objectionable. For them "substance" was a big word. There were only two substances. There was matter, that all things—even spiritual beings—were made of, and then there was the substance of God. The Son could only have been one or the other. Homoiousios attempts a Nicene–Arian compromise by creating, apparently, a third substance. The pre-Nicene Christians would have found this very strange. Here the accounts of Sozomen and Socrates differ dramatically. Socrates says Liberius was reinstated against the will of the emperor and the people expelled Felix from the church. Sozomen says that Pope Liberius was urged "to confess that the Son is not of the same substance of the Father," and he assented due to the influence of bishops that he respected. Just a couple sentences later, however, he says that Liberius drew up a statement that all who affirm that the Son is not like the Father are excommunicated. He adds that the other bishops "partially approved." Either way, Sozomen says the emperor assented to let Pope Liberius return due to satisfaction with a statement he signed, and Socrates said it was simply against the emperor's will. It's bad enough to think this happened, though there are plenty of similar stories from the 4th century. What's possibly worse is Sozomen's comment on the event! Note here that this comment by Sozomen is useless for determining exactly when the papacy began. What was the seat of Peter in Rome would be called the seat of John in Ephesus. We can't determine whether or not Sozomen was assigning the primacy and authority of Peter over all the church to the bishop of Rome, though it's entirely possible he is. He was, after all, a 5th century writer, though he was writing about the 4th century. While Protestant historians often suggest that Pope Gregory the Great (590–604) was the first actual "pope," it does appear that all bishops were willing to submit, in some way, to the Roman bishop even in the 5th century, though Gregory had battles with the bishop of Constantinople even in his day. Whether the antipope Felix II was driven out or killed by the "Christians" of Rome we may never know. We do know that Pope Liberius held fast to the Nicene faith despite strong pressure from the Emperor of most of the western world and that he appears not to have loved the world. For this, he is to be commended.